All educators, University employees and their families can attend at a special rate. 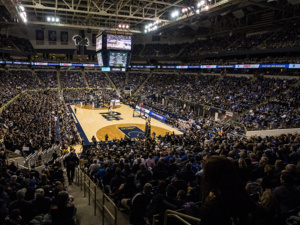 On behalf of the University of Pittsburgh and the Athletics Department, All educators, University employees and their families can take advantage of a special offer to come out and enjoy a Panthers basketball game with us this season. The Pitt Panthers have a great conference match up against #10 Virginia Tech. University employees and their families can purchase tickets discounted to $15 per fan across multiple sections in the Petersen Events Center. At the conclusion of the game, all fans that purchase this special ticket will have access to get their picture taken on center court. All tickets are delivered electronically upon purchase. Should your school wish to be sat together in a group or if you have any questions about our theme day, please contact Greg Smith in Pitt's Athletic Department at 412-383-4088 or GSmith@athletics.pitt.edu. Follow the link for the special rate. Saturday, February 16 at 4:30 p.m.